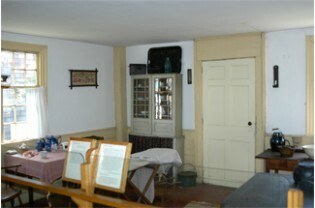 The exact date of the construction of this house is unknown, although inside mouldings and other details indicate the years between 1805 and 1825. 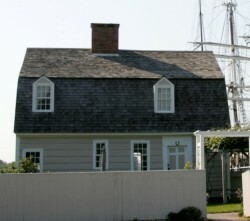 Originally situated on the opposite side of the Mystic River, the house was to be demolished to make way for a bank in 1953 when it was saved by Mystic Seaport Museum. It’s the 1870s. Do you hear the clatter of the sewing machine, the rumble of horses and wagons leaving Brown’s livery across the way? Can you feel the breeze off the river and smell that blueberry pie baking? But what’s that other odor–the horses or Mr. Burrows’ pipe? Welcome to the home of storekeeper Seth Winthrop Burrows and his milliner wife, Jane. Look around. There is laundry to iron, the grandchildren’s toys to pick up, weeds to pull, and an unanswered letter from a son at sea. For Mrs. Burrows, who is trying to run a household and contribute to the family’s stretched finances, the work is never done. Mystic in the 1870s is a well-established, hard-working coastal community bustling with civic, church, and social activities. But a national recession and steady decline in wooden shipbuilding has hit local families and businesses hard. What should Mrs. Burrows write to her stepson Ambrose, who is at sea? He will want news of his teenage sister, Mabel, and word of the big fire at Mr. Cottrell’s mill across the river. Perhaps she will share her worries about the recent outbreak of scarlet fever in the town. But should she trouble him with Mr. Burrows’ business difficulties, or the disputes with the Temperance Committee over liquor sales that have led to his latest court appearances? The Burrows House garden is filled with heirloom varieties of plants that define the practices of the 19th century.